I found this refreshing, summery dish while browsing through my Co-operative Food magazine (I like our friendly Wadebridge Co-op). You can include the courgettes and the spring onions in Camel CSA’s veg boxes, but this week I’m afraid you’ll have to get the carrots elsewhere. This recipe can be adapted in a number of ways. As I hadn’t got any sesame seeds, I sprinkled sunflower seeds on top. I also used juice from a whole lemon and omitted the honey. You could replace the spring onions with chives for a milder flavour. 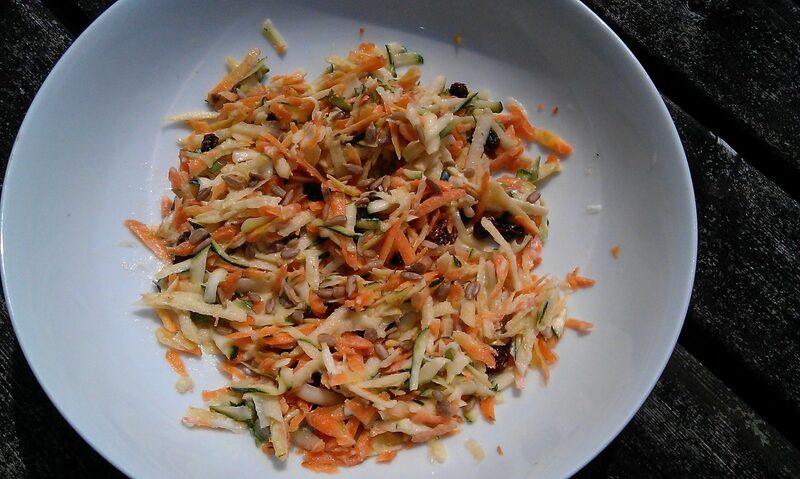 Grate the courgettes, carrot and apple into a bowl. Add the spring onions and nuts and fruit, if using, and stir together. Mix together the mayonnaise, yoghurt and honey. Add to the bowl and stir. Sprinkle the seeds over the top before serving.